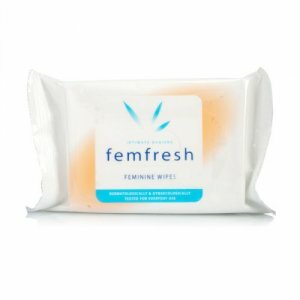 Femfresh Feminine Freshness wipes are lightly moistened with a gentle pH-balanced lotion to cleanse, freshen and deodorise. They help to keep you feeling fresh and confident every day of the month, wherever you are, at home, at work, whilst travelling, during your period. Use as and when necessary for intimate freshness. For external use only. Reseal pouch to prevent wipes drying out. Flushable and biodegradeable wipes, use no more than 5 wipes per flush. Aqua Polysorbate 80 Aloe Barbadensis Gel Chamomilla Recutita Water Malva Sylvestris Extract Calendula Officinalis Extract Panthenol Tocopheryl Acetate Lactic Acid C12-15 Alkyl Benzoate Triisostearin Ceteareth-22 Palmeth-2 Glyceryl Stearate Diglycerin Cetyl Palmitate Cetearyl Alcohol Palmeth-2 Phosphate Propylene Glycol PEG-40 Hydrogenated Castor Oil Trideceth-9 Phenoxyethanol Imidazolidinyl Urea Methylparaben Ethylparaben Propylparaben Parfum Dimethicone Methylchloroisothiazolinone Methylisothiazolinone Benzoic Acid Dehydroacetic Acid Ethylhexylglycerin Sodium Benzoate Potassium Sorbate Tetrasodium EDTA Butylparaben.